I can't remember NOT having any savings, although at times it wasn't much - with even the odd temporary overdraft. But then, I'm getting on - and the culture of saving seems to be dying out. One statistic that caught my eye recently was that 64% of Americans don't have $1,000 in a savings account to cover emergency expenses. That's nearly two-thirds of the population surviving between paychecks - and in a county with notoriously expensive healthcare. This statistic comes from a new survey conducted by The National Foundation for Credit Counseling (NFCC) - reported here. The NFCC study surveyed 2,700 Americans to determine how much money they had set aside in the event of a financial emergency that cost $1,000. 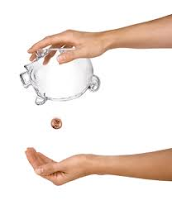 Of that population surveyed, only 36% said they would be able to turn to their savings to pay for the expense.Those individuals without savings said that they would unfortunately have to turn to an outside source to ask for money if they were faced by an unexpected expense. Although the study might have been a bit biased in selecting its sample pool, the fact that such a high number of participants are lacking a relatively modest $1,000 in savings is still alarming and is clearly something that should be addressed - for example, through better financial education. This seems to be part of a wider picture of poor financial provision by households in the US. An earlier study by the NFCC found that 30% of Americans have zero dollars in non-retirement savings. A separate study by the National Bureau of Economic Research found that 50% of Americans would struggle to come up with $2,000 in a pinch. The situation in the UK is better - but not by a lot. People in the UK are saving less (as a proportion of their income) than at any time in the past 40 years, according to the Office for National Statistics (ONS) - reported here. Moreover, a report from NS&I has estimated that some 6 million Britons (nearly 10% of the total population) don't have any savings whatsoever.Debt charity Consumer Credit Counselling Service has identified 4.3m households with no savings and 1.1m families with savings of less than £1000 - reported here. So, in the US and the UK, how will the governments be able to continue to provide a financial safety net? It looks pretty stark poblem for me - higher taxes, poorer local services and lower benefits. A good justification for not relying on the 'Government' but saving hard for yourself. Article first published as Only 1 in 3 Americans has an Emergency Fund of $1000 on Technorati.